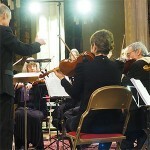 This year Trianon Music Group has commissioned five new pieces of music to celebrate our Diamond Jubilee. Ronald Corp – Jubilant Song! would prefer to remain anonymous, simply leave blank spaces on the donation form below. Each single bar costs £5 and can be bought in as many multiples as you please!